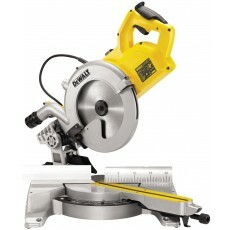 The 250mm slide mitre saw is a medium sized mitre saw making it a good all-rounder. The larger the saw, the deeper the cut it can make. Where as the smaller the size the more precise the machine can cut, all-be-it to a shallower depth. A slide mechanism on a mitre saw allows the saw blade to be moved forward and backward, which means that wood of a greater width can be cut. The blade diameter is the key determinant when choosing between slide mitre saws. These slide mitre saws have a larger blade diameter of 250mm.